I was born in post war Portsmouth in 1950, when food was still rationed. In spite of the bombed houses and the mangled dockyard, it was a good place to live and a good time to be a child. In spite of post war austerity – no money, and no loans – the welfare of children was one of the Atlee government’s top priorities. We all got pre-school free milk for calcium and strong bones. and orange juice and Rose Hip syrup with loads of vitamin C added to improve our chance of health and lower our chances of getting rickets. And all this supplied by the milkman. When we went to school we got milk at break and a hot dinner at mid day – free if it needed to be. It was that golden age of decency and integrity in government. Before Margaret Thatcher. Sugar and sweet things in general had been in short supply during the war. In fact, because sugar had to be imported it quickly became scarce. The first ration book in 1942 was called the “Sugar book” because sugar was the first food to be rationed. As the war progressed back yard honey production was encouraged as part of the “Dig for Victory” strategy and “Bee Loud Glades” could be seen for the first (and last?) time in the back yards of town houses and in suburban gardens. This was before my time of course. I was born into the 1950’s – a world with all sorts of sugar in it. Our “Bee Loud Glade” was a big jar of honey kept in the larder for vaguely medicinal purposes. Hot “lemon and honey” was cure for everything from a temperature to a sore throat. Honey was also supposed to be antiseptic, good for cuts and grazes, respiratory problems, asthma, high blood pressure, anaemia, fatigue, rheumatism and liver disease. Our jar had been given to my mum by her mum. No one remembered how old it was. We thought it was probably pre war. Mum said “it never goes off” and “it’s full of goodness”, which meant that if you were told to eat it you had to. It glared down at us from a great height, a big jar half full of grey stuff so dense you had to stab it out of the jar with a knife or heat it up by the fire. Apparently this was to do with commercial processing, which made the honey look crystallised and opaque. We kids preferred Golden syrup that looked exactly like it said on the tin, Golden and Syrupy, like modern honey. There was also treacle, which was black, for treacle tart with pastry and cornflakes. This stuff is still sold in Spain today as miel de cana – “cane honey” as opposed to miel de flores – honey from flowers. Real honey. I decided to keep bees this year to extend my little farm. I started last year with poultry. I can’t grow quality fruit like my neighbours, but they do appreciate eggs and I thought they might like honey. Also bees don’t need daily care, they are self-sufficient and you can leave them on their own for part of the year. 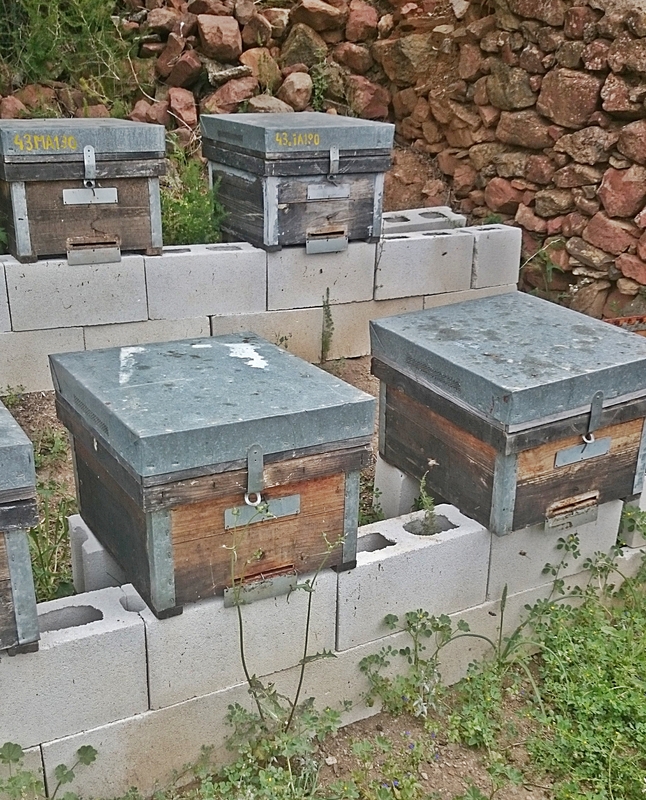 I live in a fruit-growing area, ideal for bees because pollen and nectar, the food of bees, are produced by this mixture of fruit trees and annual wild flowers every month except for the pollen gap in August, which here in the Axarquia is like a terrible boiling winter. It’s a social and neighbourly thing to do, keeping bees. They fertilise your neighbours’ fruit. The disadvantage is that bees sting, and this means you have to consider very carefully where you put a hive. You have to site it 25 metres from tracks and pathways and ideally the “bee line” from the hive to the nearest flowers should not cross a human pathway. 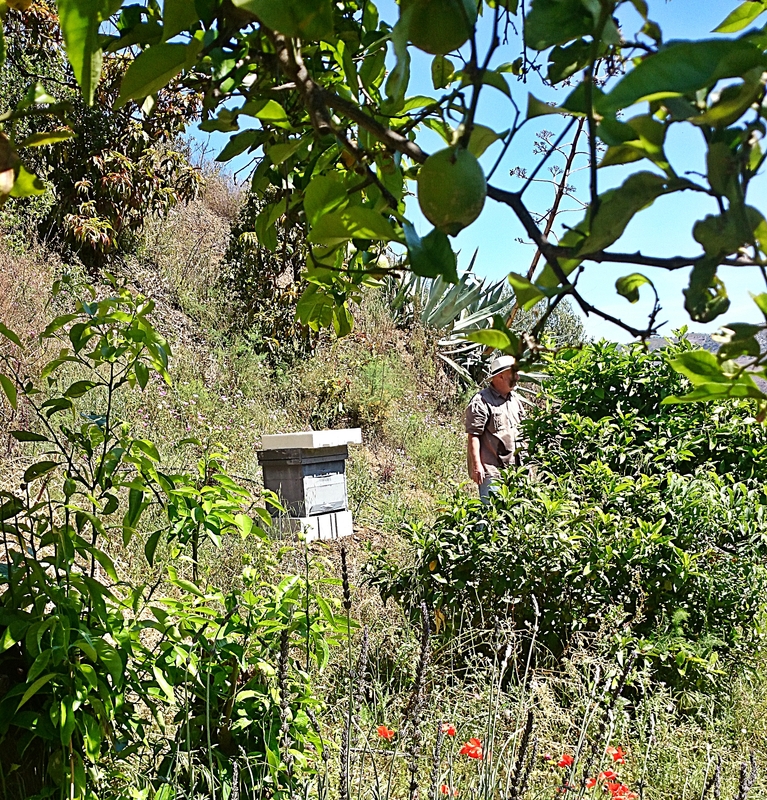 I have a little citrus grove near to my water deposit (bees need to drink a lot) and this leads out to some steep wild land overlooking a (usually) dry ravine with an avocado plantation on the opposite slope. This seemed ideal. It’s a good idea to meet other bee keepers before you get your first bee hive and this can be difficult if you live in a foreign country so I went on Facebook and found “Beekeepers, Bee enthusiasts, honey lovers in Andalucia” that has news, tips discussion and adverts for bee enthusiasts. It’s an ex pat site. 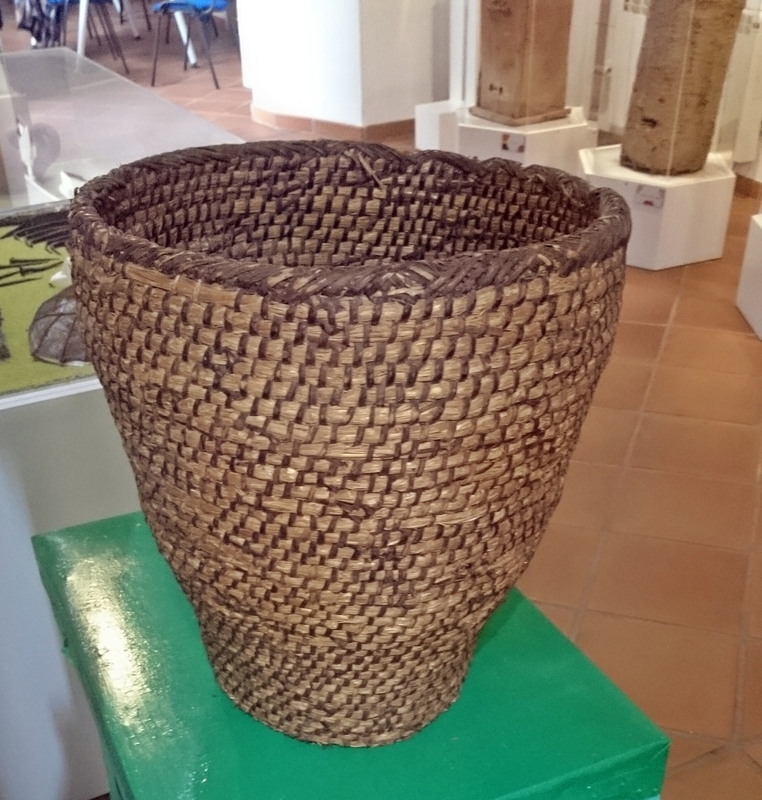 I signed up for a course at the museum of honey – the “Casa Museo de la Miel de Malaga” in Colmenar. 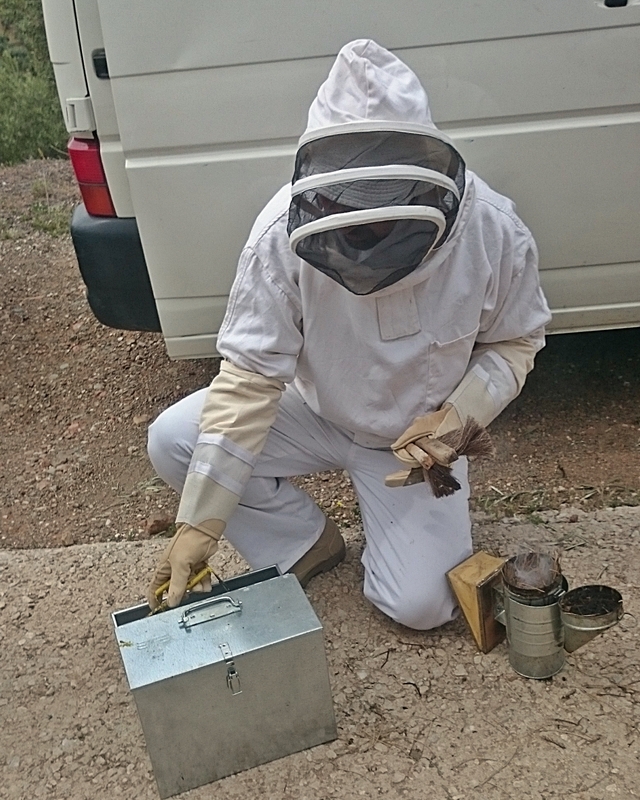 It was a two day course run by local Spanish bee keepers who spoke English. One was a vet. Half of the course was conducted in the museum and half in the field doing practical work in the apiaries. It cost €180 for two days, which I thought a lot. The fact that it was very good value was partly due to the two venues – one for theory and one for practice, partly the friendliness and expertise of the teachers, and partly the other students who were all ex pats. After fifteen years of meeting ex pats in bars I half expected a bunch of morbidly obese chain-smoking alcoholic “Tinto Tories” with their dogs. I needn’t have worried. We turned out to be a group of eight charming, intelligent people. Apart from me of course. Almost everyone knew more about bee keeping than me (who knew nothing) and everyone was cleverer. Quite a shock. Perhaps it’s the bee keeping that makes the difference. So the education for me was many layered, and I met some nice people. Students learn best from each other, under the supervision of creative teachers. The most popular hive here in Andalucia is called the Layens hive, invented by Georges de Layens in the 1880’s. It’s simple and very cheap, consisting of a plain box with hole in the front for the bees to get in and out, a flat waterproof roof, and twelve frames inside, on which the bees build their honeycomb.Each box will house a colony – a single queen, thirty to sixty thousand infertile females (workers) and some fertile males (drones). The colony with its queen, drones, and workers is like a single living creature. It takes the team work of an entire hive to make honey. The queen (which might live for several years) lays thousands of eggs per day so that the nursery workers can raise thousands more worker bees. Some of these will guard the door of the hive, some will make new honeycomb, some will fan the hive with their wings to maintain a constant temperature, some will clean and renovate old comb and some will forage the flowers for nectar and pollen. When the colony gets too big for its box, the old queen will swarm, taking part of the colony with her, leaving a new queen to develop in the old hive. In this way a colony feeds, grows, breathes, and reproduces, just like a single animal. The brood and babies are produced in the centre of the hive, the honey and pollen are foods, and are stored in the periphery.The bee keeper manages the hive and harvests the honey by removing one or two of the outer frames of the Layens hive, always leaving enough honey for the bees to get through the winter. To do this the keeper needs a bee proof suit hat and veil and a smoker. Old leaves or dry grass is put into the smoker, lit and the smoke puffed into the hive. The bees, sensing a forest fire, gorge themselves on honey. This is so that they can rebuild the colony as efficiently as possible after the fire. However, once their bodies are stiff with honey, they are unable to bend their abdomens to sting. Also the smoke masks the alarm pheromones that bees release when under attack. So the colony remains calm when the hive is opened. The two great enemies of the honey bee are varroa and insecticide. Varroa is a mite that infects the hive and destroyed Spanish honey production during the last century. Bee management requires its constant control, and you have to register your hive with the authorities so that it can be monitored. The pesticide threat is well-known and has been the cause of a mass die off of bees since 2005. The latest herbicide threat comes from neonicotinoid herbicides. The bees become addicted to the nicotine in them and bring them back to the hive. The Junta de Andalucia passed new laws this year restricting their use, though Spain is notorious for over use of all forms of pesticides and has been heavily fined by the EU for their excessive use. So wish me luck keeping this lot alive. At the moment its only one hive – just 40,000 bees, but I shall be looking to expand and I’ll keep you posted!! 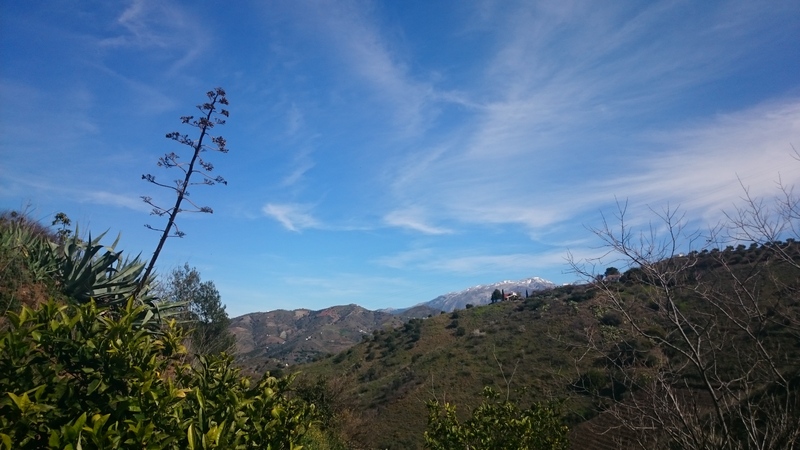 I greatly enjoy reading your blog and wondered if you would be prepared to answer some questions I have regarding environmental issues in the Andalusian agricultural sector (particularly the Axarquía and Costa Tropical) for my dissertation. I would be very interested to see if my observations of the issue match up to your experience and knowledge. If you feel you could spare me a moment, please email me and I will send over some questions. Thank you!